Today's multi‑gigabyte drum libraries include some fantastic sounds and groove presets — but they haven't taken all of the work out of creating a great drum part. Travel back a quarter of a century, to the year in which the first copy of SOS hit the shelves: this was the golden age of the drum machine. Nobody in their right mind would tell you that those machines sounded realistic, even though, in most cases at least, that was their main goal. They had a charm of their own, of course, and they still do — but nobody would close their eyes and mistake the sound for that of a real drummer. We may not call them drum machines any more, but modern drum libraries such as FXpansion's BFD2, Toontrack's Superior Drummer 2, Steven Slate Drums, and XLN Audio's Addictive Drums have inherited a great deal from the humble drum machine. Just like many drum machines, these libraries provide you with both the sounds and the sequencer needed to create drum patterns. The difference is that this time, when you close your eyes it sounds like the real thing. Sample libraries have progressed in leaps and bounds since the days when Akais and Emus ruled the studio. There's practically no limit to the size of a sample library any more, because most software samplers stream their data directly from disk. Sample sizes are now only limited by the amount of hard disk space available — and hard disk space is cheap — so sample‑library developers can and do concentrate on recording everything, including the kitchen sink (quite literally: FXpansion's BFD Percussion expansion pack contains multisamples of a kitchen sink!). Take a snare drum as a typical example. A modern sampled snare in a drum library will comprise thousands of multi‑velocity recordings. A diligent drummer will have sat and hit the snare from very quietly to very loudly hundreds of times. There are different articulations, hits, rims, side‑sticks, drags, half edges and more, each multisampled in the same painstaking way. There may be different hitting implements, such as sticks, brushes, hot rods and mallets, too, and all of this will have been recorded using multiple mics, perhaps with three direct mics (two top and one bottom), overheads and room mics, and there may be recordings of the snare bleeding into other mics, too. You'd be forgiven for thinking that all the work had been done for you. After all, you have your expensive drum sound, your mixing tools and a bunch of great-sounding presets — but assembling the various sounds, patterns and processors into a realistic sounding drum track, and one that works for a particular song, is where a lot of people become stuck. In this article, I'll show you how to harness the power of your drum library to create a realistic performance that sits well with your music. The first tip is a simple one: step away from the presets! There is a place for presets, but most are designed primarily to sell the product. In the world of synthesizers, this is known as 'Preset Zero Syndrome'. Preset Zero is the first preset that comes up when you switch on a synth, and when auditioned in a shop it will be the first sound you hear, so a lot of effort is put into making it impress. In a drum library, the same syndrome manifests itself in different ways: mixer presets that fill the entire audio spectrum, too much reverb, too much delay, over compression, and in the case of the pattern library, patterns that are far too complex and showy (if the drummer played like that in a recording session, he'd be replaced rather quickly!) to work in your track. If the goal is realism, the most logical approach to creating a drum track is to follow the same steps you would in a real studio — so let's start with building a basic drum kit. Most libraries (though not all) offer a large range of kit pieces, and the collection can usually be augmented by purchasing expansion libraries. Having the choice is great, but when the time comes to create a track, you probably want to be able to get up and running quickly. Building a kit or two and saving them as your own custom presets is a great way of getting to know your sample library — and although you probably won't use exactly the same sounds in every song, it should speed up the creative process. 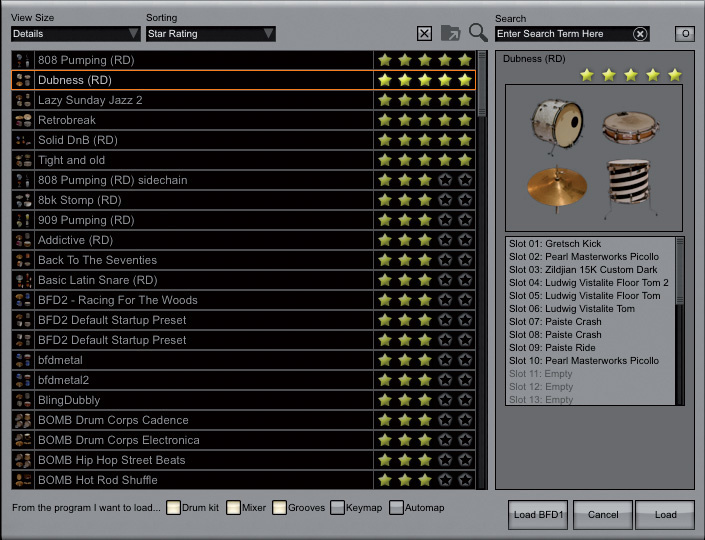 Some drum libraries, such as FXpansion's BFD2, shown here, include useful preset browsers where you can rate the drum kit parts after auditioning them.Each library has its own way of auditioning the sounds, and some have a way of recording your favourite pieces. BFD2, for example, includes an iTunes‑like browser that allows you to rate kit pieces using a five‑star system, so that you can easily find your favourites later on. When auditioning kit pieces, I find it useful to mute (or pull down the faders for) any room or ambient‑mic signals, so that you hear the kit itself, rather than the sound of the room (if you like the kit sound but not the room, it's easy enough to add some ambience later on). Aside from some very basic volume balancing in the mixer — much of which will already have been done for you — there's no need for any real mixing at this stage. The goal is simply to have some natural‑sounding drum kits, to provide a starting point — just as you'd pick the right kit pieces in a studio. With your kit choice made, the next step would be to sit the drummer down and get him or her to perform while you chose and placed mics, set levels and so on. Thankfully, the messy business of miking the drum kit has been done already! In this case — unless you're handy with a set of V‑Drums — we don't have a real drummer, so this is where your 'programming' skills need to come to the fore. The best way to build a track will depend on the order in which you like to record or program the various instruments in your composition, and which need to be most prominent in any given song. For example, if you tend to record bass and guitar parts first, you're more likely to spend time creating a pattern where the kicks and snares hit in just the right spots to support the bass and any rhythm guitar, whereas if you prefer to start by laying down a drum track to provide a solid foundation on which to build the track, you have a much blanker canvas. The easiest — though not necessarily the most fruitful — way to commence is to browse your pattern library for a MIDI loop that will serve as your starting point. This is the only time I'd suggest using a preset, and it's a perfectly valid way to begin. Indeed, starting with a well‑played pattern of one or two bars can often provide inspiration and take you in directions you might not otherwise consider. Remember preset zero? In many cases, factory patterns themselves are too complex to make a solid foundation for a drum track. Sure, the performances might seem incredible, but we're not trying to demonstrate musical virtuosity: add a bass, rhythm guitar, lead and vocals over the top, and the mix will probably feel cluttered. It's much more effective to start by picking a pattern that's close to what you're looking for, and then simplify it — which, thankfully, is a fairly painless process! The pattern must first be opened up in an editor. For some libraries, such as Addictive Drums, this will mean dragging your pattern into your host and using the host's piano roll or drum editor. For others, such as BFD2 and Superior Drummer 2, you have the additional option of opening the pattern in a built‑in editor. Here (top) we can see a typical one-bar loop from a library before 'weeding'. 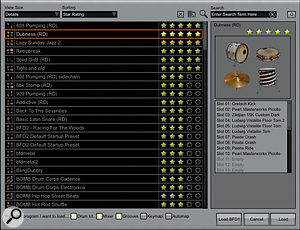 This screenshot shows the same file after weeding: the crash, several snares and open hi‑hats have all been muted; and one of the closed hi‑hat notes towards the end of the loop has been moved. The result is a much simpler groove, which loops much more naturally. Because none of the notes have actually been deleted, we can re‑enable any of them later if needed. Whichever approach you take (it doesn't matter which), I'd suggest that you start the 'weeding' process with the kick and snare drums. Whilst the pattern is playing, remove any non‑essential kick‑drum hits. In most genres you can afford to leave just one or two kicks per bar. There are some exceptions of course — double bass‑pedal patterns for example — but use good judgement and you'll find that the pattern soon starts to feel a bit more natural as it loops. Rather than permanently deleting the unwanted notes, a nice trick is to simply 'disable' or mute them in the editor, so that you can later re‑enable a few of them in strategic positions during your song. Not all editing environments allow this, but if yours doesn't you could simply reduce the note velocities to zero. Similarly, disable any non‑essential 'ghost' hits on the snare: these are the quiet hits that often appear in between the main snare hits, and although they can add interest, when the exact same ghost snare hit is repeated every one or two bars it sounds robotic and unnatural. Finally, disable any non‑essential cymbals, which should be easy enough to spot. What you'll be left with is the main groove of the part, around which you can construct your track, but without all the fussy extras that tend to get in the way of other parts of your arrangement, and which tend to sound unnatural when repeated in short loops. The other approach is to start with a blank canvas, and program your own drum loops from scratch. Although this can at times seem a slow, painstaking process, it eliminates the often tedious and time‑consuming task of sifting through thousands of unsuitable MIDI patterns. But where do you start? Here are a few tips for 'rolling your own' drum parts. Import an MP3 or WAV file of your chosen 'source' song into your DAW, and ensure that any automatic time‑stretching in the DAW is switched off for this file (for now, you want the loop to play back at its natural tempo). Next, find a suitable section of the song where you like the drum pattern and can hear it clearly. Slice the clip on the first beat of the drum pattern and discard the section you don't need, then set the host to loop for one, two or four bars (or whatever length you'd like to transcribe), with the left loop locator placed at the start of the file. Adjust the host tempo until the loop end falls naturally into place, so that the host is at the right tempo for the track. Now you can set about manually copying the pattern to a MIDI track or drum editor. There are some tools that can make the transcribing process easier. 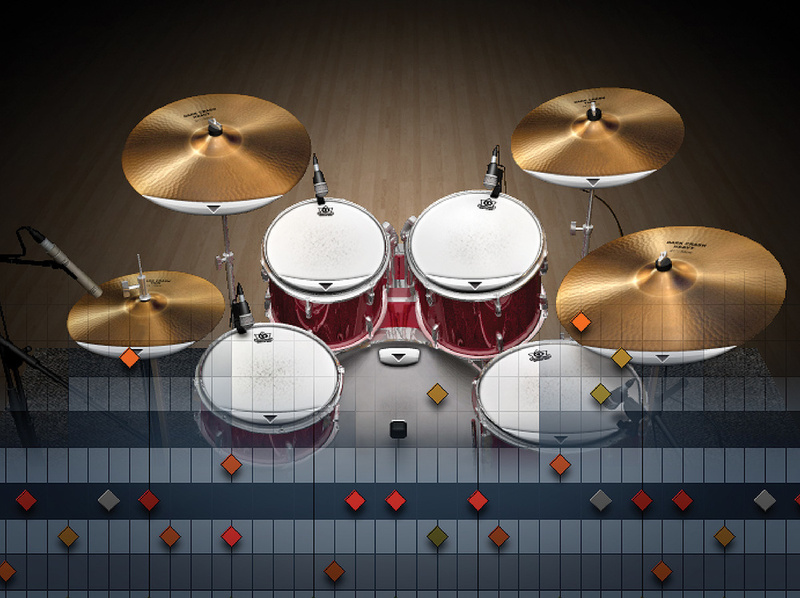 Toontrack's Drumtracker, for example, automates the process entirely, by analysing an audio file, automatically detecting all the kit pieces and then generating MIDI notes for each one. Alternatively, you could try using a drum‑trigger such as Smart Electronix's freeware KT Drum Trigger, setting the thresholds and EQ'ing the trigger side‑chains to pick up only the desired kit pieces. There are limitations to this sort of drum detection, though. It works best on close‑miked drum recordings, and with no other instruments present in the mix. That's great if you have access to such recordings, or if you're working with a loop from a construction kit, but when transcribing drums from a full mix, I find that the manual method is still the only way to get it right first time. To make it easier to transcribe, you could try time‑stretching your audio so that it plays back more slowly. If you time‑stretch by 200 percent, for example, the file may sound terrible, but the individual hits in the loop should become easier to identify. If you halve your host's tempo whilst you transcribe, and then revert the tempo back again afterwards, you should end up with a MIDI part at the same tempo as the source track. Even if you don't have MIDI files, you don't have to use audio files, as there are plenty of places to find ready‑transcribed drum patterns that you can manually program in: the Internet is chock-full of such patterns, and there are many books on the subject too. It helps if you understand the language of drum notation, and although that's outside the scope of this article, it is worth saying that it is very easy to learn — and if you learn to read drum notation, it will make life much easier for you when programming your own parts. The final option is to physically play in your drum pattern. Despite this article being about 'programming' drum tracks, almost everyone has access to a MIDI keyboard or drum pad controller. Even if you're not a drummer, tapping in a simple kick/snare or hi‑hat pattern is easy, and probably the quickest way to input the notes you want into the right places. Even if you don't have a MIDI input device, you could record the tapping of a finger on your desk, and use that with a drum‑trigger plug‑in to create a part. A good place to start programming your track is with either the hi‑hat (or ride), or the kick and snare. If you concentrate on one or two elements at a time, depending on how competent your finger drumming is, you should find that you can layer up the pattern in multiple passes. You don't always have to start with the kick and snare drums. Here, we can see a pattern that has been created starting with a hi‑hat part counting out the beat, and then kick and snare placed in afterwards to create a groove. If the aim is to create natural‑sounding drum parts, though, you need to think about what a drummer is physically capable of playing at any given time. Two toms being played at the same time as a ride, crash and hi‑hat, for example, is likely to sound 'wrong' because a drummer has only four limbs! Similarly, you wouldn't usually hear any hi‑hats during a tom fill. So even if you've no intention of learning to actually play the drums, it's worth developing an understanding of how a drummer might approach a part. One method is to perform a basic 'counting' beat with hi‑hat or ride hits playing eighths or triplets, for example, and then punctuate that pattern with kick and snare hits; another is to establish a basic 'walking' beat with alternating kick and hi‑hat pedals and add in snare and tom or cymbal fills. There are many different approaches, and finding a good text book or video on drum fundamentals can help you get better at this. A drum pattern of a few bars will provide the basic building block with which you can begin constructing your drum track. If you've been manually entering notes or playing them in from a MIDI controller, you may find that, despite the notes being in the right places, the pattern sounds robotic. If you started with a factory pattern, the groove will feel much more natural, as most are recorded by real drummers, and the timing and velocities will have all the natural variations that make the part sound 'human'. Even so, you may want to alter the groove to better fit your track. The 'groove' of a drum pattern is made up of two main factors: velocity variations (the difference between how hard the drummer hits each of the notes) and the timing variations (when the drummer hits each note). Let's take a look at velocity first. Real drummers aren't perfect, so they will never hit a drum in exactly the same way twice. One of the simplest ways we can best emulate this is by programming in some variation to the velocity of each hit. In a typical phrase, a drummer would naturally emphasise certain parts by playing louder. He might increase his enthusiasm slightly towards the end of each bar, for example, or as a verse comes to an end, and this effect is easily replicated by increasing the velocity of certain hits in the same area of your programmed pattern. Most drummers also tend to hit just that bit harder with their strongest hand, and unless they've worked hard to overcome the habit, they will also usually lead with it. So, in a typical hi‑hat pattern, you can reduce the velocity of every other hit to mimic the effect of playing alternate notes with different hands. This approach extends to drum rolls also. This is usually enough to inject some reaslism, but you can take the same idea as far as you want: for example, look up instructional videos for the Moeller technique (in which each stroke will play three drum hits) on YouTube, and try to mimic that effect by programming different velocities. Generally, snare hits will also vary in velocity according to the musical genre, but whatever the style, try to make sure that the main snare's velocities vary subtly throughout the song. The same advice applies to the kick drum. That said, it's not necessarily a simple case of randomisation: if you're building up to a chorus, the last snare is likely to be hit slightly harder than the preceding one, for example. Modern libraries do a fantastic job of reproducing the different responses of an individual drum when hit at different velocities, so just getting this right takes you a long way towards a realistic pattern. Additionally. most libraries now have a built in function to prevent the 'machine‑gun effect' (in which identical samples are triggered one after another, which results in an unrealistic machine‑gun‑like stuttering), so that even if you do have two identical velocities repeated one after another, the library will never play back the same two samples in succession. You may be wondering why you should go to all this effort when a mix engineer (or you!) will probably come along and try to make everything sound consistent, and iron out some of the dynamic range using compression, particularly on the kick and snare. But rest assured that the subtle differences in the samples will still show through and add up to create something more natural. The other key factor that dictates the 'feel' of a pattern is variation in the timing of the drum hits. This in itself is often referred to as the 'groove', although, as I've said already, I prefer to think of the groove as a combination of velocity and timing variations. Drummers will never play with perfect time. The human brain is actually far more appreciative of repetitive departures from a perfect grid, and therein lies much of the art of a drummer. A snare played consistently late can seem to slow down the track while actually maintaining the tempo, and an early snare can add a sense of urgency. The effect is easy to see in your DAW: a hi‑hat line played in sixteenths by a drummer will lose all it's mojo when quantised in your DAW to a perfect 1/16 grid. When programming from scratch, though, it's quicker to simply program your pattern to a perfect 1/16 grid — and, luckily, modern DAWs and drum‑editing software have plenty of tools to help add desirable timing variations afterwards. Perhaps one of the most powerful of these tools is known as 'groove extraction', whereby the DAW takes the groove of one pattern and applies it to another part. A pattern in this case can either be audio or MIDI, and different host programs achieve this in different ways. This means that you can load up a MIDI loop, or a sample from a favourite song (as long as, again, there's a fairly 'clean' piece of drumming) and transfer the feel and timing from this to your own programmed loop. The beauty of this is that the source can be just about anything. You can even tap out a simple 16th-note groove on your desk, recording it as you go, and take a groove from the resulting audio file. An unquantised groove with fairly extreme timing. The same part with an interative quantise of 50 percent. The same part again, but this time it is fully quantised (100 percent). Another method of tweaking the timing of a pattern is with variable-strength quantisation — or 'iterative quantise', as it is sometimes known — which is a great way to tighten the timing of a pattern without loosing the general feel. Imagine a 'straight' quantise: notes are moved from whatever position they currently occupy, and placed perfectly on the grid. Iterative quantisation simply allows the user to choose how far the notes move towards the 'perfect' place on the grid — so you're able to choose to move the notes only 10 percent of the distance towards the grid, resulting in a tighter‑feeling pattern, while still retaining 90 percent of the timing variation. Most hosts now have a way to achieve this, which should be easy enough to find, but if you're unsure it should be discussed at length in your DAW's manual. Yet another groove tool is swing which, as you might have guessed, is another form of quantising. Apart from straight quantising, swing was the only other form of quantisation that you used to find on the drum machines of old, and it's something that has survived the technological changes because of its usefulness. Swing attempts to emulate a groove where every second note is delayed, which tends to give a pattern a syncopated or 'stumbling' feel. Different swing presets will give you a very different result: 1/16 is the most used, but don't overlook 1/8 or 1/32. Just like variable quantise, swing can be applied in varying depth, so you just dial in as much or as little of it as you desire. Often, applying swing to an entire groove can overwhelm the groove, so something I do quite often is to apply swing only to the hi‑hats, or to the percussion elements of a drum track. Some software drum instruments include an automatable control to introduce swing to the groove, but if yours doesn't, it's easy enough to do using your DAW's quantisation functions. The last method of manipulating timing is manual adjustment, and there's a great deal to be said for simply rolling up your sleeves and getting stuck in with the mouse. All the methods described so far have one disadvantage, which is that they cannot differentiate between different parts of the kit. If you analyse a real drummer's recording, you'll find that different kit pieces hit at the same time are actually fractionally apart. A typical example of this is something I mentioned earlier: a snare that drags slightly. This means that the drummer hits the snare fractionally later than the other kit pieces, giving the snare (and the whole pattern) a 'lazy' feel. It is always worth making sure that simultaneous hits never happen at exactly the same time in your pattern. Part of the beauty of these different quantisation methods is that they can be combined in any way. Steal the groove from one loop to give feel to another, and then apply some variable quantise and swing to taste, and finish off with a bit of manual tweaking. All of this will help give a natural feel to the pattern. The 'double up' method of drum‑track programming.If you've followed my advice this far, you should by now have a fairly strong and realistic‑sounding drum pattern, lasting a few bars in length — but how do you turn this short piece into a complete drum track? If we think in terms of a traditional song structure (verse, chorus, bridge and so on), the drum patterns generally change for each part. It may be as simple as switching the hi‑hat for a ride when moving from verse to chorus, or it may involve a completely different pattern. What you need in order to start the process of arranging your drum track is a base pattern for each section of your song, which you can achieve by using all the techniques we have discussed so far. Assuming you have those, we can move on and turn these small patterns into a track. Simply taking the one or two‑bar base loops and repeating them is obviously not going to give you a realistic result — so I use what I like to call the "Double Up” technique. The drum track will need to flow and feel natural throughout. Most drum tracks for modern rock and pop are surprisingly repetitive, a million miles from the preset zero patterns we discussed earlier. Luckily, this makes turning our simple loop into a drum track much easier. Make A Two‑bar Loop: Take a one‑bar loop created using all the methods we've discussed so far. Now duplicate it, to make it two bars long (the actual number of bars here might vary, but the doubling remains consistent). We'll treat these two bars as our new 'working loop'. The trick is to make this new two‑bar section feel natural, and not like a one‑bar loop repeated. Focus On The Kick: To start with, take a look at the kick pattern, move a kick by an 1/8 or 1/16 of a beat in the second bar, and alter the velocities ever so slightly. Focus On The Snare: Now move on to the snare, and perhaps unmute one of the ghost notes you muted previously, or just add one in if there are none. Hi‑hat Feel: With hi‑hats, moving, adding, or deleting an open hat in either the first half or the second can really change the feel. The key here is to make some very subtle changes to the second bar in order to make these two bars feel 'as one'. Repeat To Make Four Bars: Once you're happy with the result, the process is repeated. The new two‑bar loop is duplicated and becomes four bars. The latter two bars are edited with subtle changes to keep the pattern interesting and alleviate the impression of looping. Carry On Doubling: Once the four bar section is feeling good, duplicate and repeat the whole process again and you'll have eight bars (see the 'Doubling Up' box). If you go to the SOS web site, you can hear various examples of the Double Up technique in progress. For these audio files, I made a basic kit in BFD2 consisting of a Gretsch kick and toms, a DW Maple Snare, a Bosphorus hi‑hat and some Zildjian cymbals. I did nothing to the mix other than to reduce the ambience signals (overheads, room and second room) a little. Because the song we're building requires parts of eight bars in length, it might be pleasing to put a small fill at the end of the eight‑bar section, in order to lead us into the next section. Simple fills can be carefully programmed in, or you can do a little cut and pasting. Most pattern libraries come with huge amount of fills, and just as with the main drum part, you can find one you like and copy only the important elements of the fill. In order to make the fill blend in with your existing pattern, delete whichever element you have copied before pasting in the fill. This will give room for the fill while still keeping some elements from the original pattern. Once the fill is pasted in place, the next step is to get it sitting correctly. All you need do is make sure the fill's note velocities are in the same range as the original patterns, apply any groove quantising needed to make it consistent with the main part, and do a bit of manual nudging to get the feel right. You now have a complete section of your song. It could be a verse or chorus — the artistic decision is yours, of course — but you are now well on the way to completing your drum track. The differences between various sections of the song (Verse A, Verse B, Chorus A, Chorus B and so on) are very much open to artistic interpretation, but for each section you can either repeat the whole process so far, or adapt an existing section to fit another. Often the difference between a verse and a chorus, or a chorus and a bridge, can be as simple as switching a hi‑hat pattern for a ride pattern while leaving all the other elements largely the same. Sometimes you can get away with transposing the hi‑hat notes (remember to move any open/or semi‑open notes too), but my preferred method is to play a new ride pattern on my MIDI controller and apply groove quantising to taste. The rest of the song's construction should be a simple case of bolting sections together. Some additional attention might have to be paid to the transitions between sections, but you're nearly there. That gives you the basic drum track, but modern drum libraries allow us plenty of scope for further crafting of the 'performance'. One of my favourite features for this is the 'Global Dynamics' function in BFD, which is the virtual‑world equivalent of telling a drummer to play harder or softer (there are similar parameters in other drum libraries too). Of course, in the real world it would be utterly impossible to change the playing dynamics of a drum track after the recording, but in the virtual world we're able to do so at any time. A drummer will emphasise certain parts of a song by either increasing or decreasing the intensity of the playing. A typical place to do this would be in the few bars leading up to a change from verse to chorus, where the drummer might put more energy into his playing as the song leads up to the big singalong. By using the Global Dynamics, this effect can be emulated beautifully, without the need for hours of tedious editing — and it is even possible to write this into your host as automation. I've found that a good approach is to assign the Global Dynamics parameter to a knob or slider on your MIDI controller, and then play through the entire song, recording the dynamics changes live. It is possible to achieve the Global Dynamics trick in many DAWs — even if you're using a drum library that doesn't have a dedicated function for it — by utilising any tool which adds or subtracts velocities to the drum track. 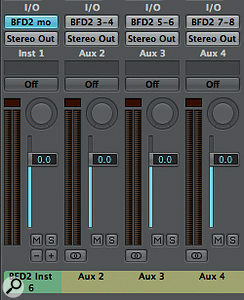 To my knowledge, the only host that can't do this is Pro Tools: although Pro Tools has a velocity offset in the Real Time MIDI Properties, it cannot be automated, so unless you're prepared to commit your MIDI performance to audio as you tweak the offset, it is of little use for varying the velocity amount as the song progresses. In Logic, it's quite difficult again, as you have to set up something in the Environment — but it can be done. Cubase users are in luck, though, because they can insert a MIDI Modifier into the MIDI Inserts section of the Track Inspector and automate the Velocity Shift parameter. Similarly, Ableton Live users can use the Velocity MIDI Effects plug‑in on a MIDI track, and automate its parameters. Another element of a real drum track that normally changes at least to some degree during a song is tempo (see the 'Tempo Change Analysis' box for some examples). Some songs are, of course, recorded to a click track, and therefore never deviate from a certain tempo. But while this makes editing and programming simpler, if the objective is to emulate a real drummer performing without a click track, you really have to look at tempo variation. There are no hard and fast rules to where and how tempo should change over the duration of a track. Besides obvious tempo changes at the boundary between sections, there are always more subtle, gradual changes, which might not be perceived directly by the listener, but still add to the overall feel of a song. Every modern host has facilities to create tempo changes during the song and these can employed to good effect. This is something that you should give thought to well before you start laying down any audio, though, as if you lay the audio to a click track you're pretty much stuck with it (there are some salvage techniques, but that's way outside the scope of this article). So if you're starting with the drum track, it's easy enough to make changes after the initial programming; but if you prefer to lay your guitar and bass down first, it might be worth creating a tempo track initially, so that the click includes those subtle changes. Because modern drum libraries sound so good, the bulk of the work involved in creating a realistic drum track is in the programming itself. Modern host DAWs and the profusion of third‑party plug‑ins offer us such great editing and mixing tools that we are able to create realistic drum tracks faster than ever before. As a result, more and more people are turning to these tools to achieve something that just wasn't possible 10 years ago: a realistic-sounding drum track created entirely with samples. In fact, there are now plenty of rock and pop records that you'll hear on the radio that feature drum tracks created in a similar way to the ones we have discussed here: the humble drum machine has finally come of age. If you head over to http://labs.echonest.com/click/ you'll find a fascinating web database of tempo plots for popular songs. All you need to do is type in the name of the artist and track and you'll be presented with a neat graph showing tempo deviation throughout the song. There is also a version that lets you upload your own files for analysis (http://static.echonest.com/bpmexp/bpmexp.html). Here are some interesting examples I found that you might want to bear in mind when programming your own tracks. Kraftwerk's 'The Model': the flat line confirms that the tempo isn't set by a human drummer! The Rolling Stones' 'Gimme Shelter'. During the song's four and a half minutes, drummer Charlie Watts gradually ramps up the tempo by three or four beats per minute. The song is a steady builder, and that is reflected in the tempo plot. It's still a gradual change, and possibly not even intentional, but demonstrates what is a natural human response to the increasing intensity of the song. Radiohead's 'No Surprises'. There is a much more pronounced variation in this song. You can clearly see the breakdown at around one minute, 50 seconds, and the effect is very obvious when you listen to the track. The speed noticeably changes and to wonderful effect. Intentional changes like this that can really help your programmed tracks feel human and realistic. The White Stripes' 'Seven Nation Army' is another example highlighting the human element of drumming. The plot clearly shows the deviation from the theoretical tempo. What is interesting here is the almost exact repetition of the plot starting at 1m and then again at 2m15s. From 1m onwards, you can see the verse slowly building in tempo until we reach the chorus at 2m, after which the cycle is repeated. 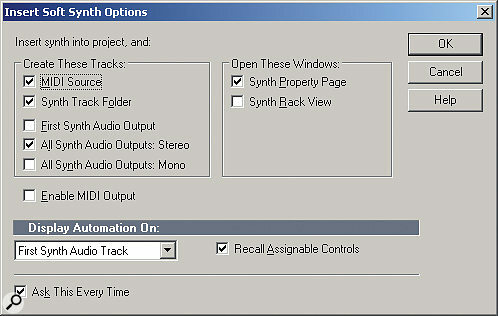 When inserting a new instrument into your project, Sonar will pop up a dialogue box called 'Insert Soft Synth Options'. If you don't see this dialogue box, open the synth rack and click the third button from the left to bring up the properties dialogue then uncheck the 'don't show me this again' check‑box. Now you will see the options whenever you insert a new instrument. 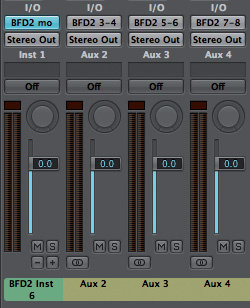 There are various options for enabling multiple‑outputs including ones for mono and stereo tracks. Enable either of these and you will see the additional outputs for that plugin are created along with the main outputs in both the arrange page and the console. Most plug‑in drum libraries, such as BFD2, Superior Drummer 2, Addictive Drums and any like Steven Slate Drums that are based around NI's Kontakt engine, contain fully featured mixers, allowing you to mix and process your drum sound without ever leaving the plugin. Whether or not your library includes such a feature, it can be very useful to output individual channels or kit pieces to separate channels in your host so that you have access to the full range of plug‑in effects in your DAW for each kit part, as well as room mics, overheads and so on. Here's how to set up some popular DAWs to receive from multiple‑output plugins. Pro Tools requires a combination of an Instrument Track and additional Auxiliary Tracks. On the left we can see the Instrument Track with BFD2 inserted as an Instrument in the Insert section. The other 4 tracks are Auxiliary Tracks. Use Command+Shift+N or Ctrl+Shift+N to create as many Auxiliary Tracks as you need, then for each one go to the I/O section in the Mixer and from the Input drop down menu select an output from the Plugin submenu. Much like Pro Tools, Logic Pro uses a combination of a main Instrument track, which hosts the plugin, and Auxiliary Tracks which monitor the input from the plugin's additional outputs. When Logic detects that a multiple output instrument has been loaded in an Instrument Track, it adds a small + icon on the bottom right of the instrument's mixer channel. If we click this button once, Logic will add an Auxiliary Track to the right of the Instrument Track and very kindly setup the input to be the first additional output of our plugin, very neat. Click again to repeat the process. Of course you can change the output used for the Auxiliary Track's input in the I/O Section of the Auxiliary Track's mixer channel. Cubase does have an Instrument Track, however it cannot be used for multiple output plugins (only the first pair of stereo outputs is used). Instead the VST Instruments Rack must be used. Press F11 to open it. Once the plugin is loaded into one of the slots here a small icon will appear to the immediate left of the plugin's name. Click on this icon to access a drop down menu of the plugin's available outputs. You can enable or disable individual output, or enable them all. Once this is done, the enabled outputs will appear as additional channels in the Cubase mixer, ready for use. One of the most important aspects of getting a drum track to sound realistic, like a polished recording of a natural kit, is the way that the kit and its constituent pieces are processed during the recording or mixing stage. In many modern drum libraries, lots of the critical engineering decisions — such as microphone choice and placement, recording mediums and basic processing — have been made already. This is why, at the beginning of this article, I suggested that you build a couple of kits from scratch and did little or no mixing or production to them: with a well‑programmed MIDI track, your kit should come alive, and sound both natural and interesting. You might need to do some EQ or a little compression here and there to fit the drum sound into your mix, or perhaps use a tape‑emulation plug-in on the drum buss, but you should already have something that sounds very much like a real drum track. Having said all that, though, there are still some things to consider. Listen to a range of tracks that feature acoustic drums, and you'll soon notice that, quite apart from the different sound of the drum kits themselves, the drums on each seem to occupy a different 'space'. That sense of space may be due to any number of factors, such as the panning of individual kit pieces, how wide the kit as a whole has been panned in the mix, the room in which the drums are recorded, and what reverbs have been used. All the various mixing tricks are outside the scope of this article, but it's worth dwelling on a few points. Whether you do it within the plug‑in, or use individual channels in your mixer, panning the different kit parts in a natural way is one of the keys to a good sound. Panning is an important consideration. For a natural sound, try panning the various kit pieces according to their respective layout on the drum kit. A right‑handed drummer will always have their hi‑hat positioned to their left, for example, so from a listener's perspective, the hi‑hat sound will come from very slightly to the right. The same logic extends to all the kit pieces — although in most productions you'll find that kick and snare are panned dead centre, even though their kit pieces may be positioned slightly off. But also bear in mind that for the listener, the drum kit only occupies a relatively narrow area in the room — so while the hi‑hat may be slightly off to one side, that doesn't necessarily mean that the cymbals need to be placed at the extremes: you could make the drum kit as a whole as wide or narrow as you like. Most libraries are recorded with a pair or more of room microphones, perhaps including a pair of PZM mics, and the presence of room ambience can really help to gel all the individual kit pieces together into a coherent whole. Of course, the room tone itself is fixed, but if you have a favourite reverb plug‑in or hardware unit, you can bus out the individual kit pieces to your host and use that instead. In fact, so important is the room sound that you might not even want to use all of the direct mics. If you're aiming for a particularly vintage vibe, for example, try pulling out all but the kick and snare direct microphones, and mix in overheads and room mics to taste. This will give you the sound of a kit recorded using only a few microphones — and then you could perhaps add a little tape emulation, courtesy of a plug‑in, for extra authenticity. A more modern sound will often consist of more direct mics and a lot less room ambience. A stash of inexpensive percussion instruments gives you extra tools for injecting some human feel into your programmed parts.What follows may at first sound like cheating in the context of this article, but it's actually one of the best ways to some realism to drum parts. 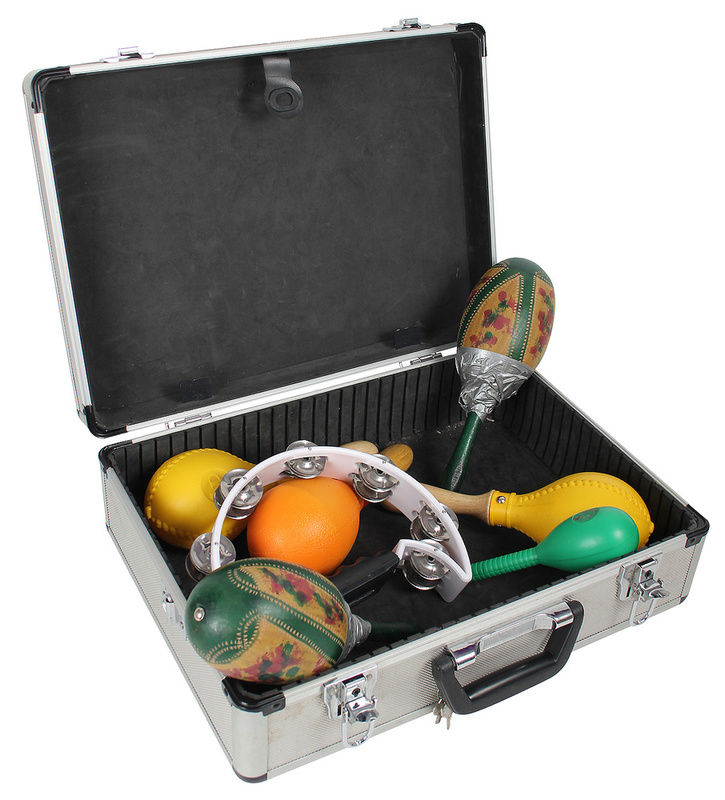 Your local music shop will sell all sorts of reasonably priced percussion instruments — shakers, tambourines, bongos, cabasas, all sorts of cymbals, guiros, handbells, triangles, vibraslaps and wood blocks, for example. All of these can be played by anyone, are cheap and small enough to keep lying around the studio, and can really add to the sense of realism if layered onto your drum track. Once your drum part is in place, you can hook up a mic (you don't need anything fancy; the ubiquitous SM57 or a basic condenser will do just fine) and record some live percussion over the whole track, maybe changing the percussion during the different sections of the song. It's amazing how much difference something as basic as a shaker can make (to find an audio example of this, visit the URL given in the 'Audio Files' box). The degree of control offered by some drum libraries is bewildering, and extends as far as allowing you to determine the amount of bleed in the different mics. When recording a real acoustic drum-kit performance, each of the mics will pick up a bit of everything. The snare mic(s), for example, may pick up some of the hi‑hat, kick and toms. It's tempting to try to remove that bleed, so you have more isolation when you want to mould the sound of kit pieces using compression and EQ. However, with a well-recorded kit whose mics are phase‑aligned to avoid comb‑filtering problems, the bleed can actually help to make things gel together, and many top engineers will work with it deliberately. So depending on the sound you're going for, and how much you plan to process the individual kit pieces, it might be worth playing with the bleed levels in different mics to make things sound that bit more natural. I've created several example audio files to illustrate in a more practical way the techniques that I've been discussing in this article. Go to Programming Realistic Drum Parts Media for more details.